I’m back! 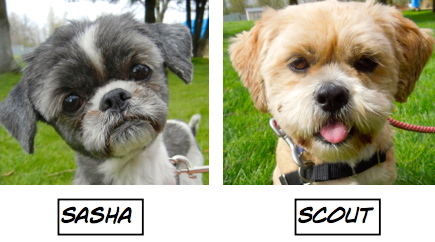 My husband and I had a wonderful trip, spending the most time in Edinburgh, Scotland where I saw lots of dogs with caring owners. 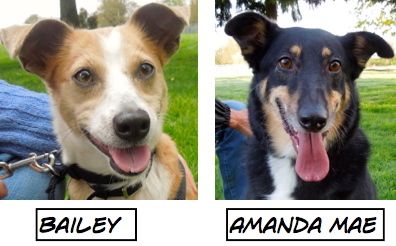 It is great to be home again and to catch up with the Willamette Humane Society news. 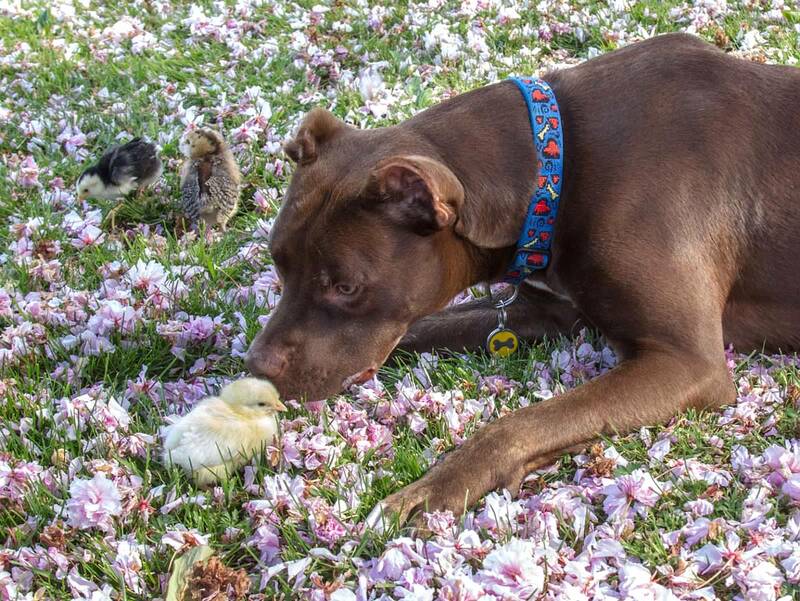 Talk about adoptions! 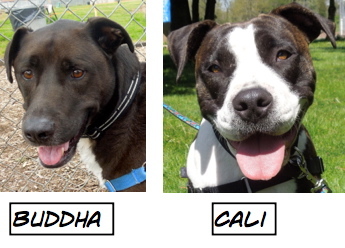 There were many happy new beginnings for lots of shelter dogs during my absence. 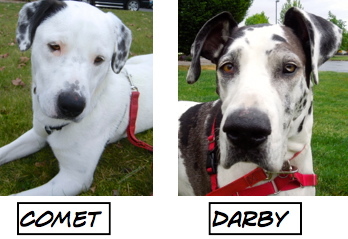 Here are the Blog Dogs and a few others whose pictures I had taken, but had not yet featured on my posts. They are now settling into their new homes. 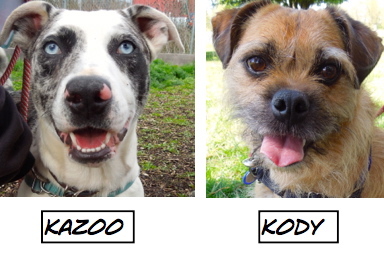 I wanted to highlight one very special adoption that happened just before I left. 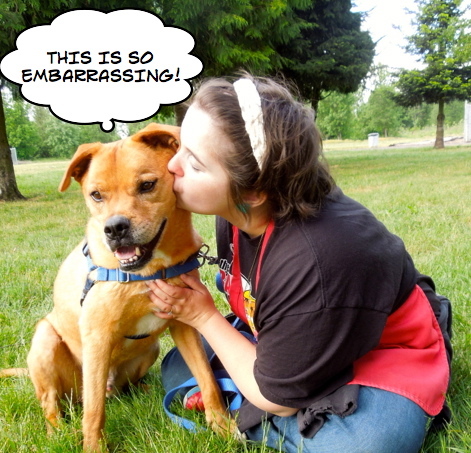 If you are a regular reader of my blog, you have seen many pictures of Sarah, my wonderful friend who assists me while I take pictures of the new dogs for the WHS website. 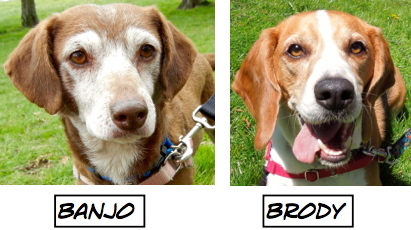 Banjo is a nine-year-old Beagle mix. Sarah fell in love with him during his long stay at WHS. Finally he was adopted. 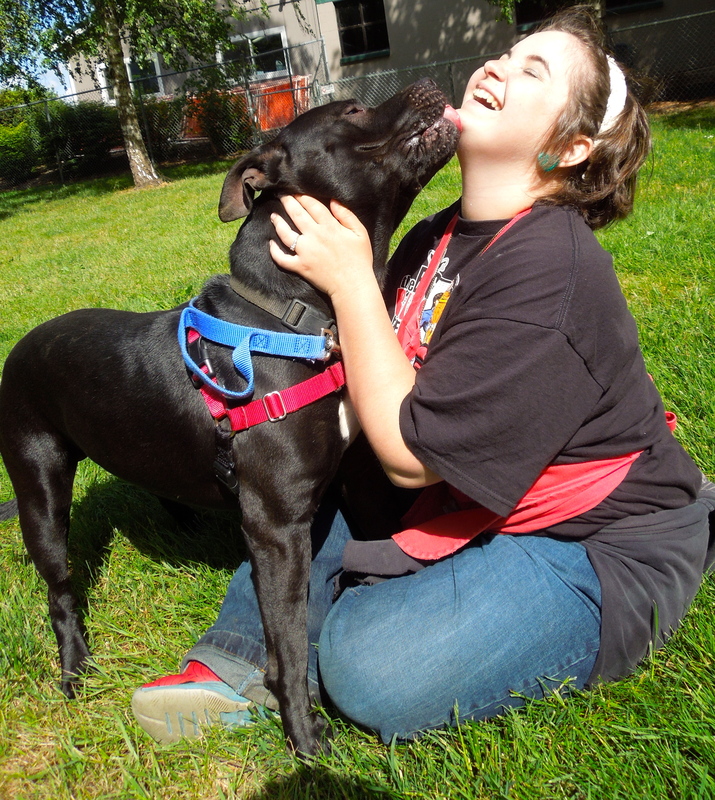 Soon afterward, Sarah moved into an apartment where she could have a dog. Then Banjo was returned to the shelter. Need I continue? Sarah and her fiancé, Bruce, took Banjo home. I’m thrilled for all three of them! Banjo’s new name is Gimli and he has settled into his forever home perfectly. I still get to see him each week, as Sarah brings him to play group. I love happy endings! 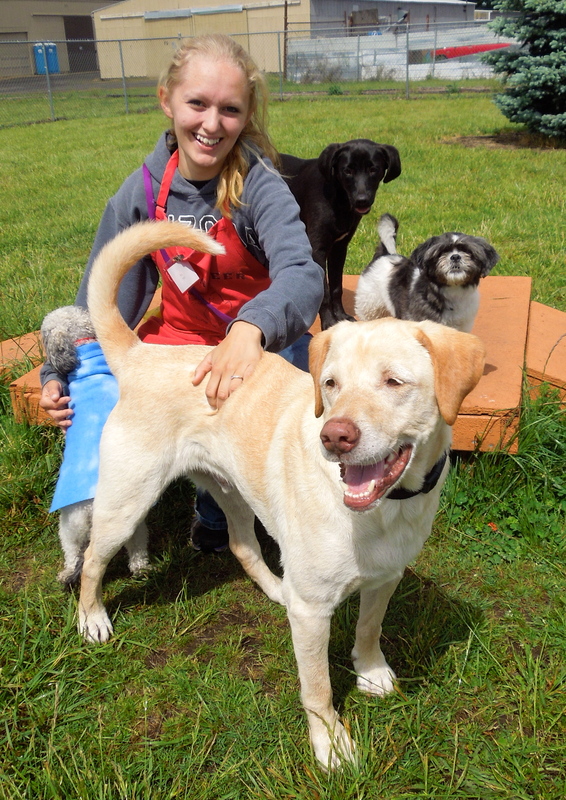 Here are Gimli and Sarah during play group a few weeks ago. 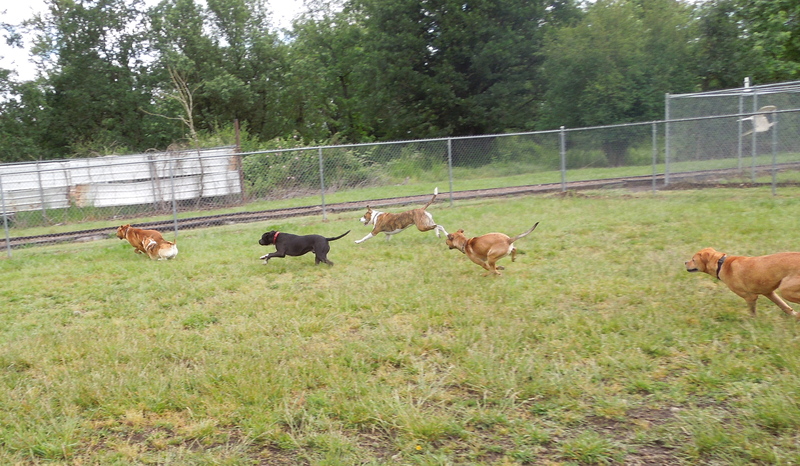 Play group on Sunday was an active one! There were many racing games as well as some quiet moments. 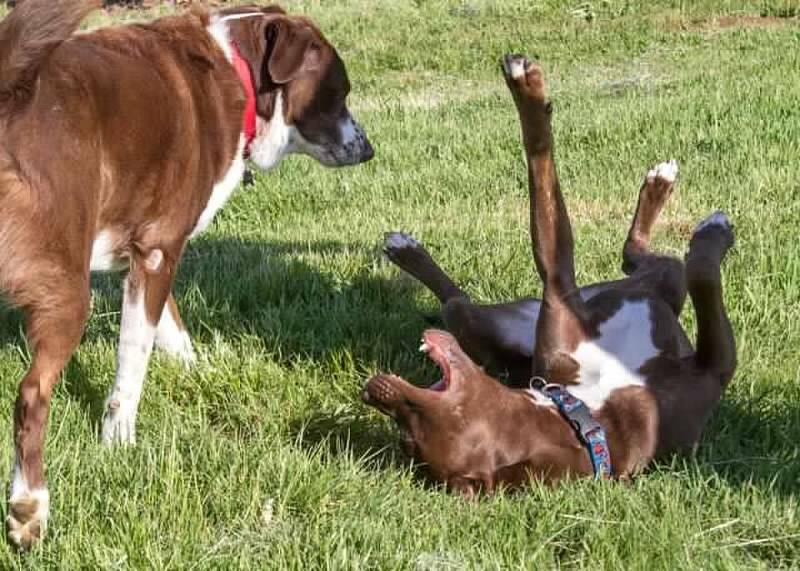 Sometimes no words are exchanged, the dogs just enjoy the thrill of racing. I love the expression on these faces! Could dogs look any happier? Gunner is still waiting for his forever home, but he is not depressed about it. He continues to be optimistic and in the meantime enjoys the attention of his many WHS fans. 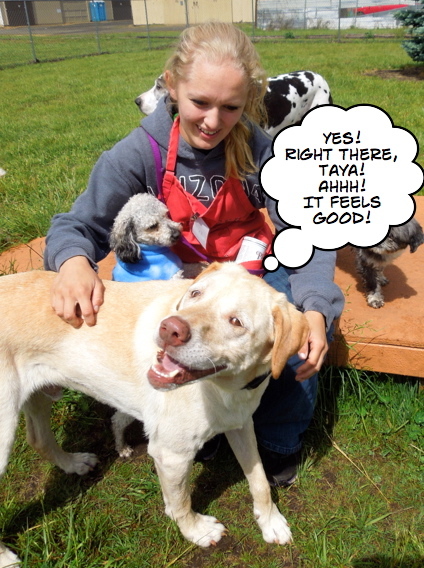 This cute pup named Paige loved hanging out with Taya. 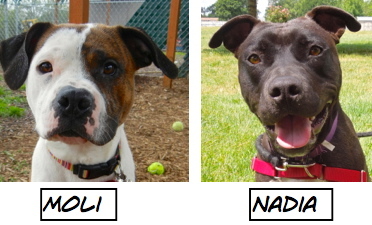 I had hoped by the time I returned from my trip that every dog I knew at the shelter would have been adopted. Most were. However, I’m going to start this week’s post with three who were not. 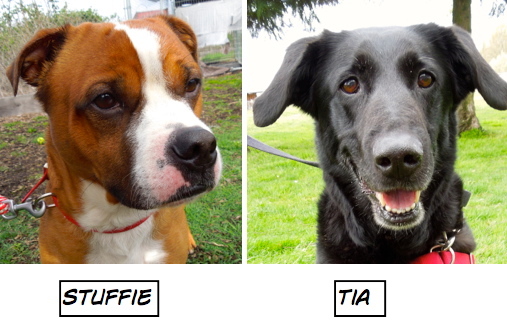 All three are wonderful dogs who continue to wait patiently for their perfect fit of a family. I’m hoping that this week their wait will be over. 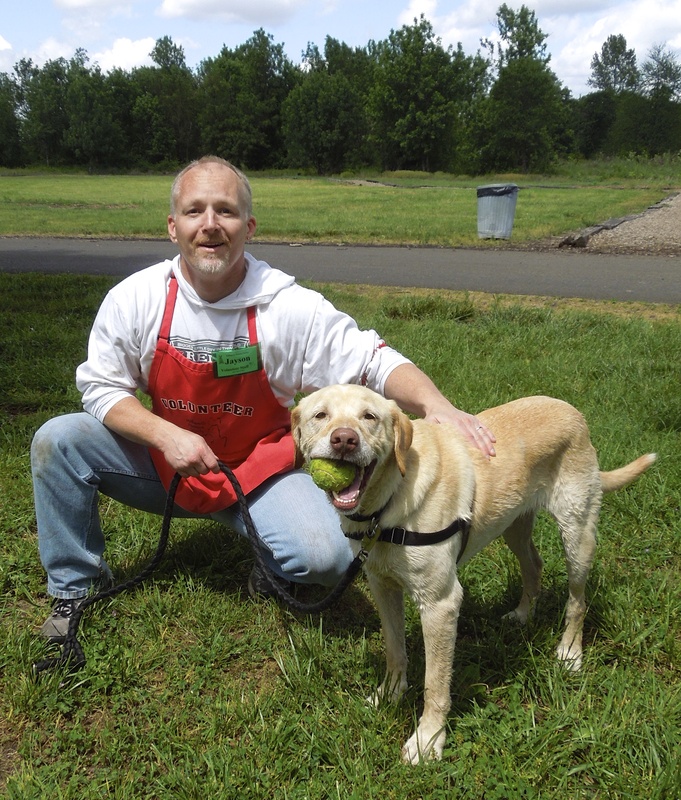 Gunner is a six-year-old Lab mix who lives to play fetch with his tennis ball. Here he is on Sunday with volunteer Jayson just returning from a rousing game in the big yard. 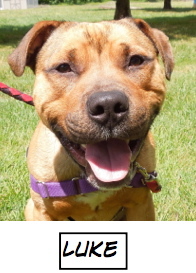 Gunner gets along with other dogs (he LOVES play group) and has lived with children. 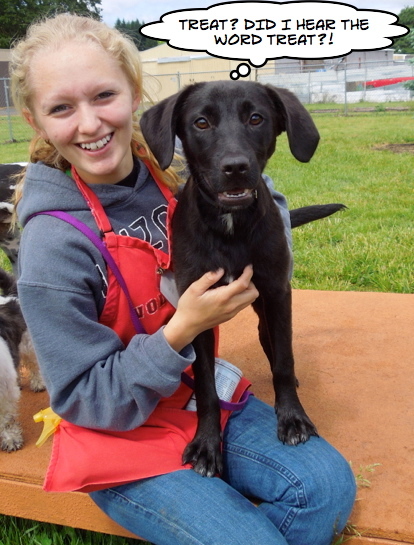 He is house-trained and a shelter favorite. He’s such a good boy! 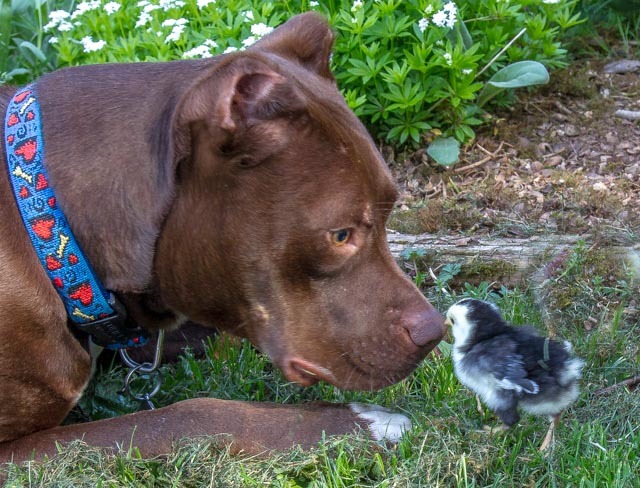 He’ll make a perfect best friend. 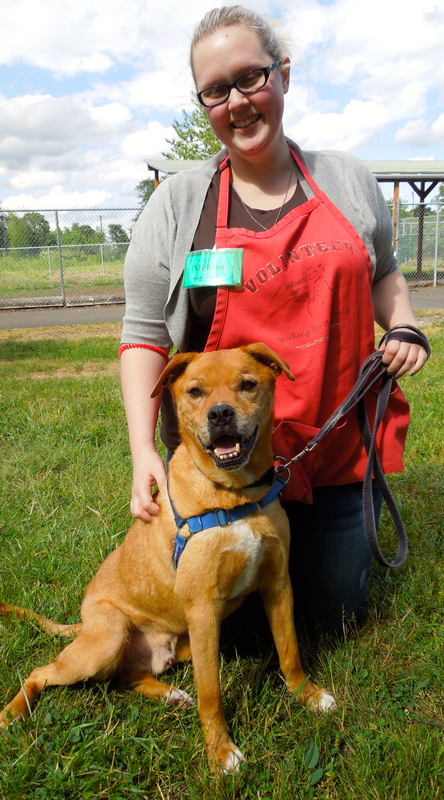 Romeo is another staff and volunteer favorite. He has been at the shelter since March 6th. 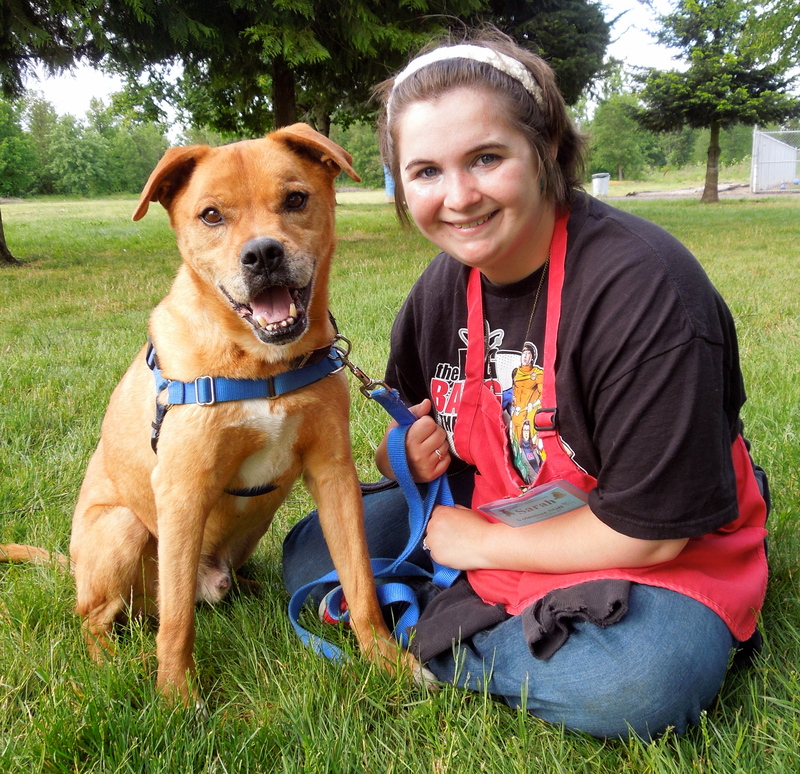 He is a nine-year-old Lab/Boxer mix and is such a gentle soul. He loves to go for walks, enjoys the quieter side of play group, and is always up for spending quality time with his fans. Here he is with Melissa on Sunday. And here he is with Sarah. I didn’t think it was possible to make him blush, but I think Sarah did! Kyra has been at WHS since April 8. 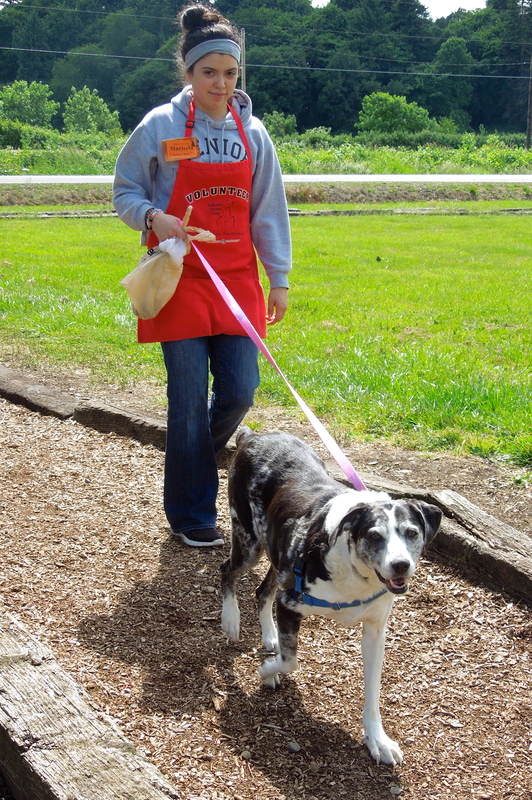 She is a nine-year-old Australian Shepherd mix who enjoys a long walk and human company. 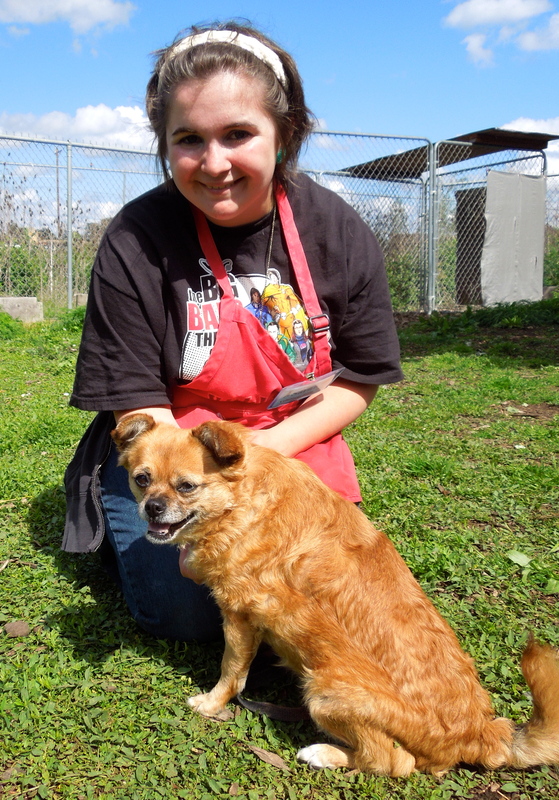 She’d rather spend her time with people than other dogs, though she gets along with them fine. Here she is on Sunday with Marisela. Kyra seems to always be smiling. 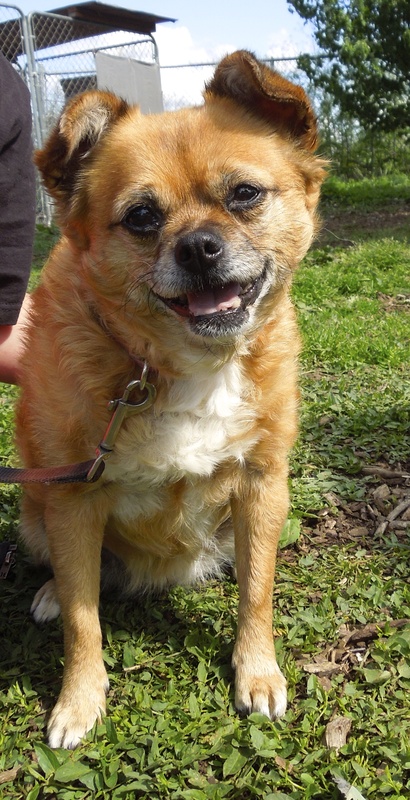 She’s a delightful older girl waiting for her new family to find her. Looking for a jogging/running/anything-active partner? That’s ME! 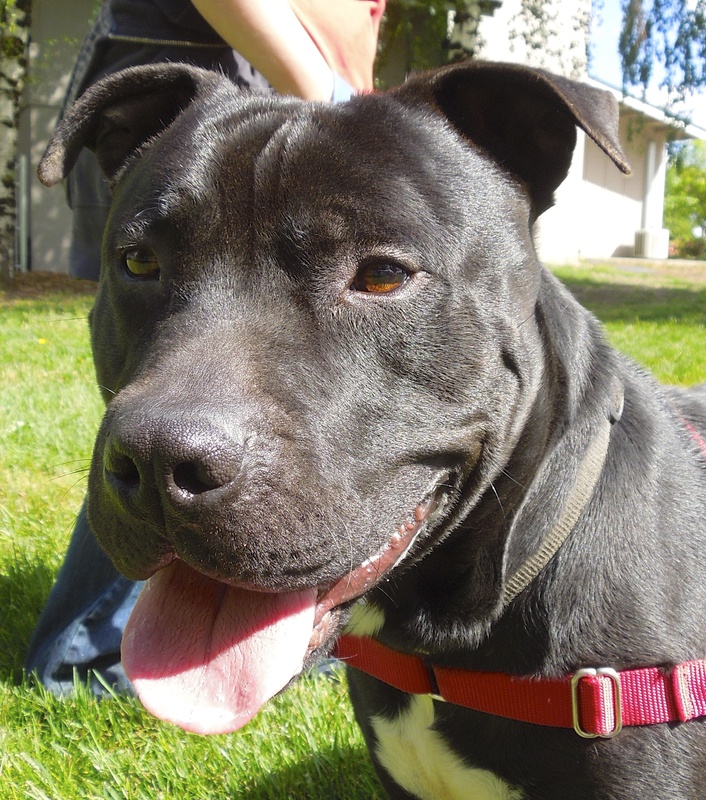 One of the first new dogs I met on Sunday was Waylon, a two-year-old Pit Bull Terrier mix who is a bundle of good-natured energy. He’s a happy-go-lucky boy who loves to play. He had a blast in Sunday’s play group. He does need some work on polite leash walking, as he is a very eager boy. 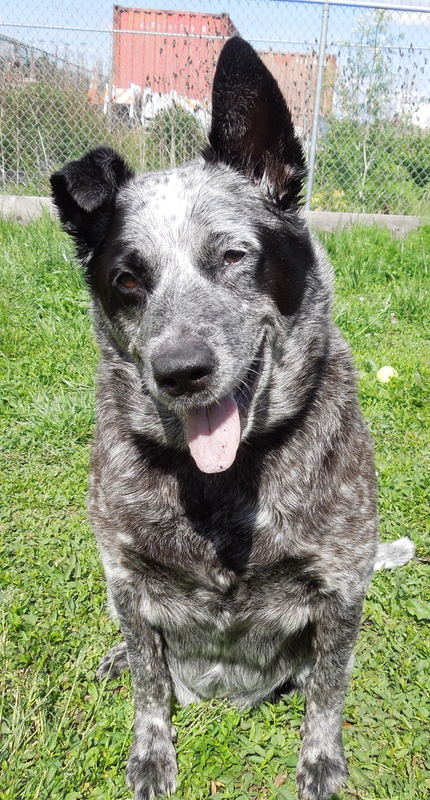 He also cannot go to a home with cats or livestock, as he likes to chase them. But for the right family fit, he’ll be a wonderful addition. He’s a great candidate for our WHS training classes where he’ll learn impulse control. 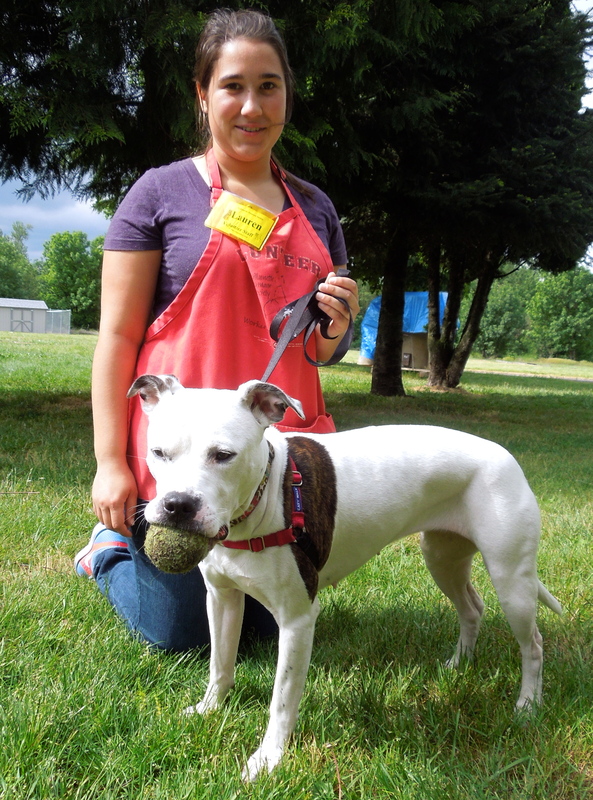 The next newbie I met was Nugget, a two-year-old Pit Bull Terrier mix who is such a delightful girl! 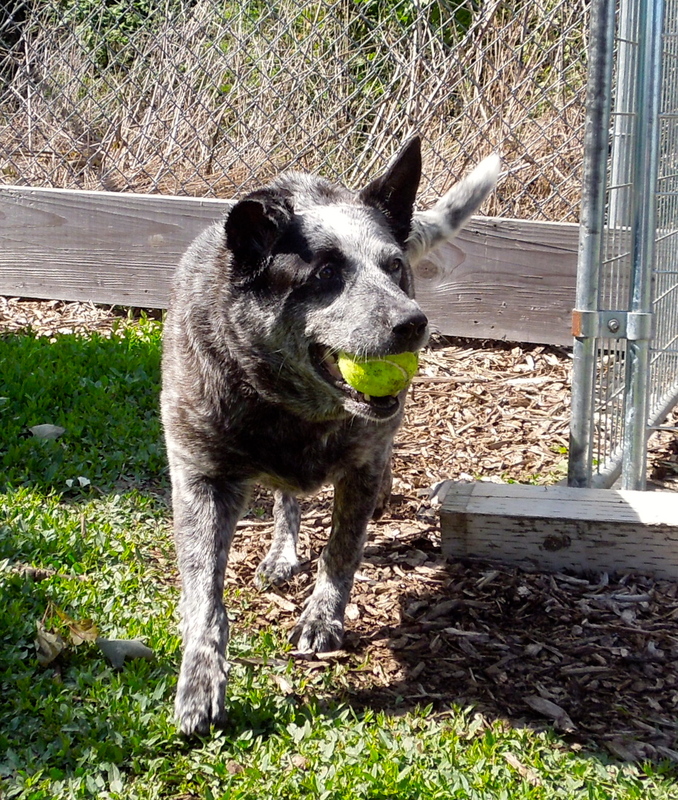 She is another tennis-ball dog who, while loving to play a game of fetch, also is a gentle companion afterward. Here she is with Lauren on her way back to her kennel. And here is the picture I took of her for the WHS site. I love her face! I have a little cold, but I’ll soon be just fine again! Meet Miss Kitty (don’t ask, I have no idea! ), a ten-year-old Chihuahua. She is recovering from a cold, and so is in the ISO kennels. She seemed to be feeling a lot better on Sunday and was anxious to spend some time with Sarah. Miss Kitty is an uncomplicated, well-behaved older gal who is waiting for her new family to find her and take her home. I’m recovering from a cold, too, but I don’t let it stop me! 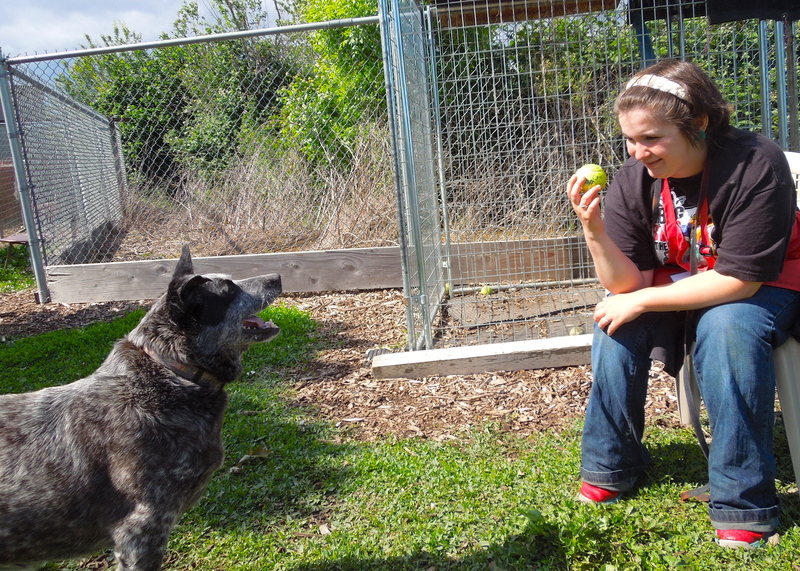 Also in the ISO kennels because of a cold is this happy five-year-old American Blue Heeler named Earnhardt. 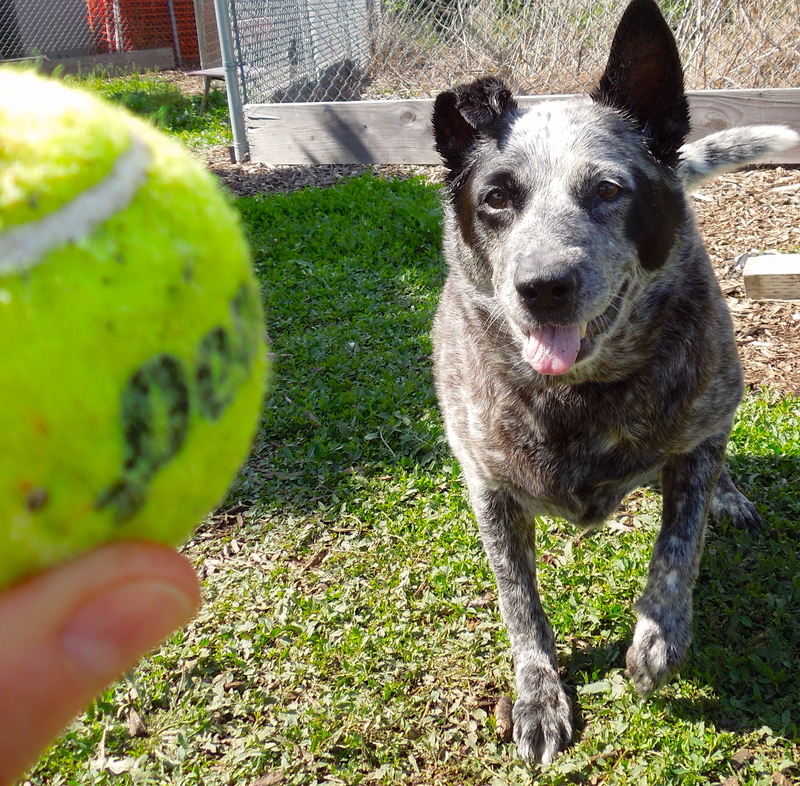 Looking for a working dog who lives to play fetch and drops the ball at your feet? Look no further! 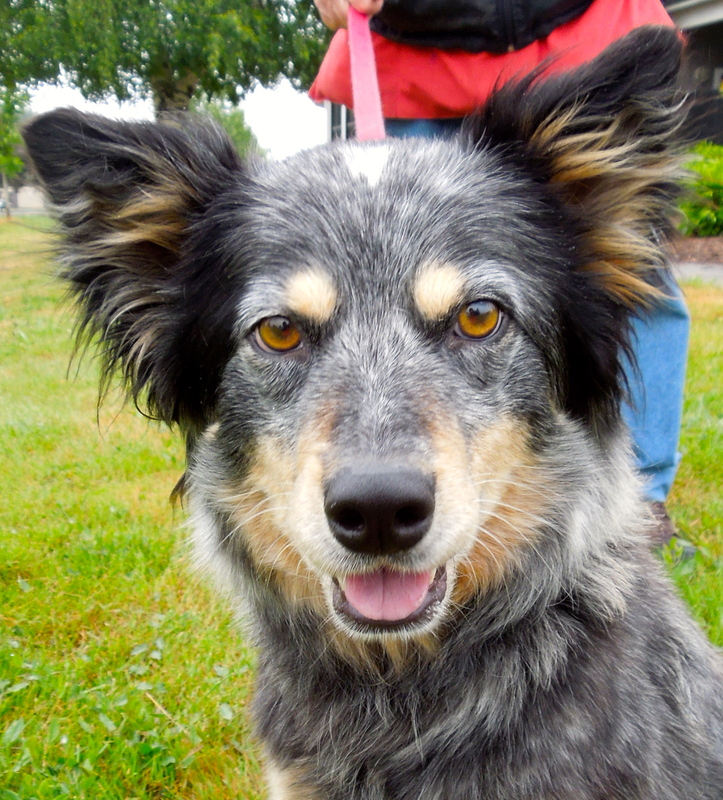 Earnhardt is a well-mannered girl whose herding instinct could be a problem around cats or small children. So a catless home and older kids will make a better fit. 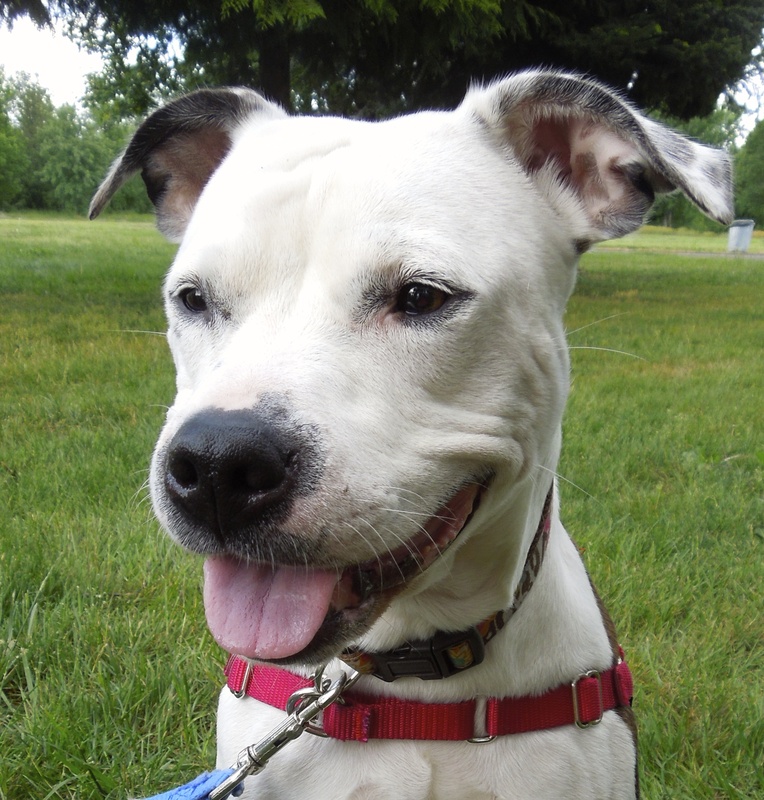 She has lived with other dogs and is house-trained. 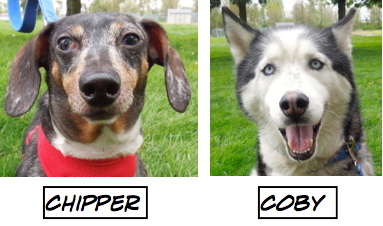 Sarah and I found her a delightful character who will be a great addition to an active family. What do you mean, I’m not a lap dog? Don’t tell Hank he isn’t a lap dog! 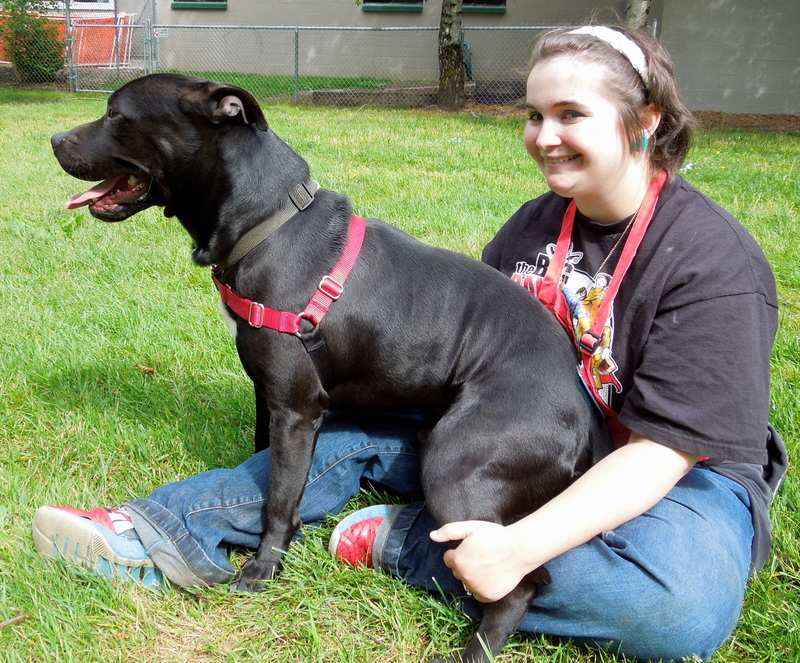 This three-year-old Pit Bull Terrier mix decided that Sarah’s lap would do just fine to sit in while he surveyed the area. 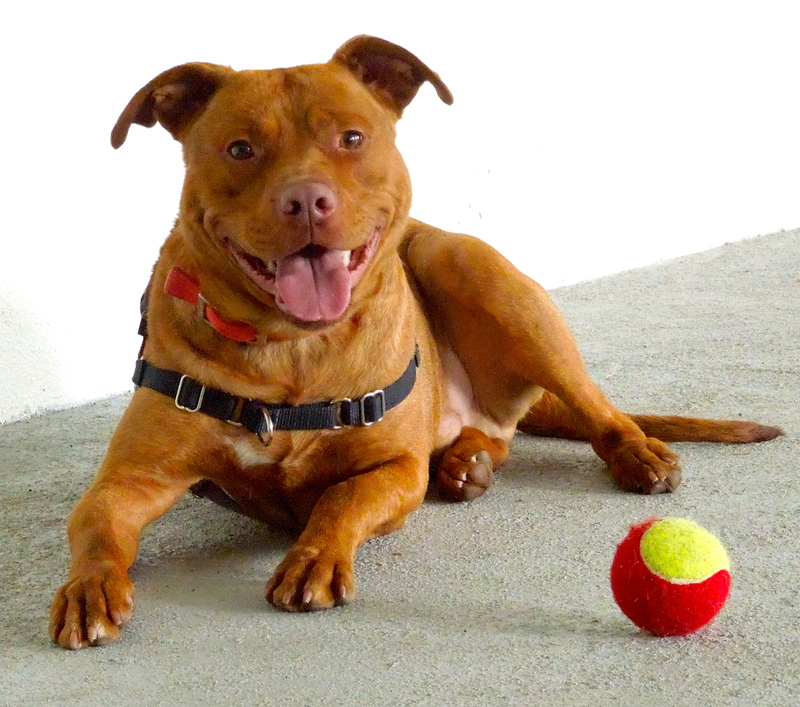 Hank is a loving, goofy, happy boy who has lived with a small dog (that explains why he thinks he’s a lap dog!). He likes children and everyone else. He had fun in play group. These pictures say everything about his personality. We may be older, but we’d still make great friends for you! 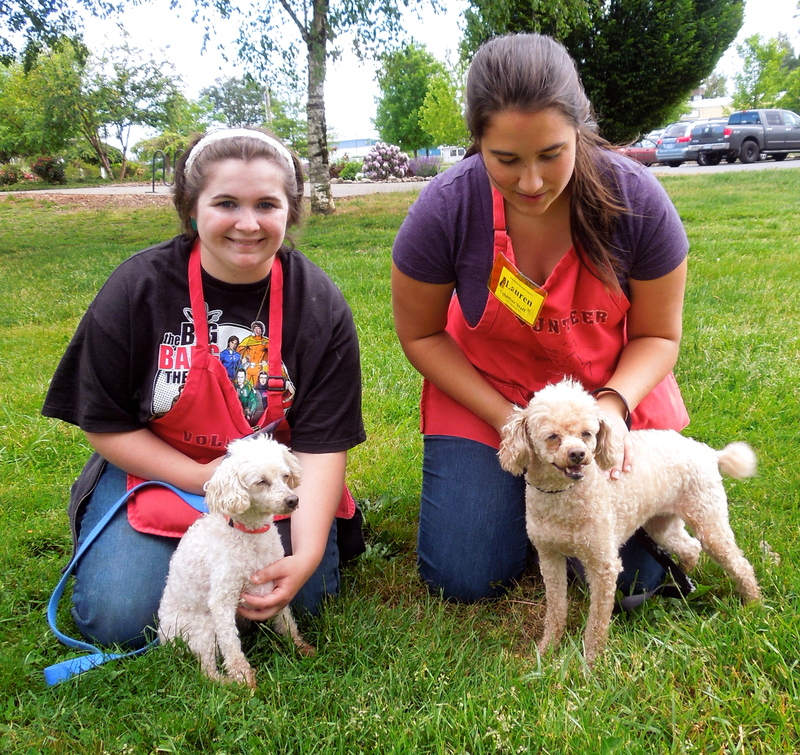 I was just about to head home on Sunday when I saw Sarah and Lauren out with Heidi and Dakota, both Toy Poodles, who are 14 and 12 years old, respectively. 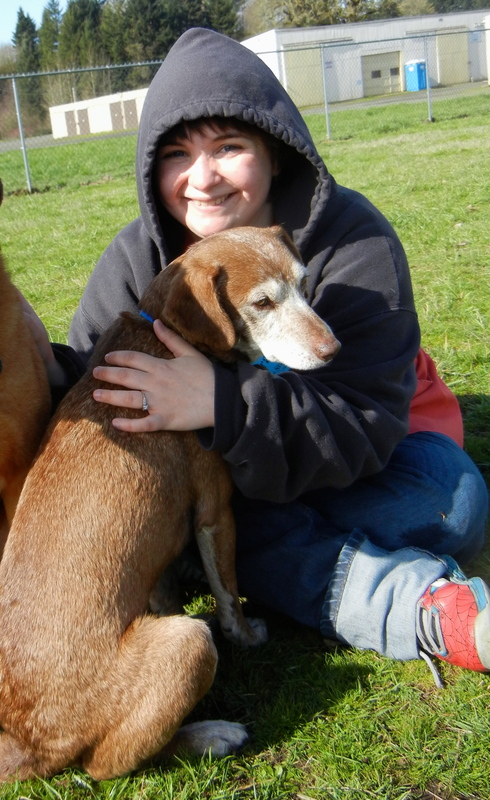 While taking on older dogs may not be for everyone, it seems that there is always someone who is touched by such cases and opens their heart and home. 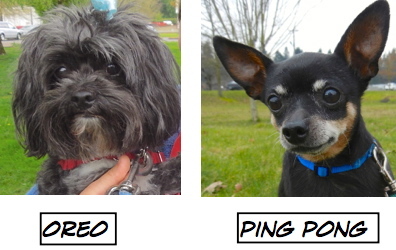 I’m hoping that such a someone will find these two sweet old ladies soon. I’m new here and I’m looking for a home. Maybe yours? Today (Wednesday) I hadn’t planned to take any pictures because of the almost constant rain. However, between showers, I was able to take a few photos. 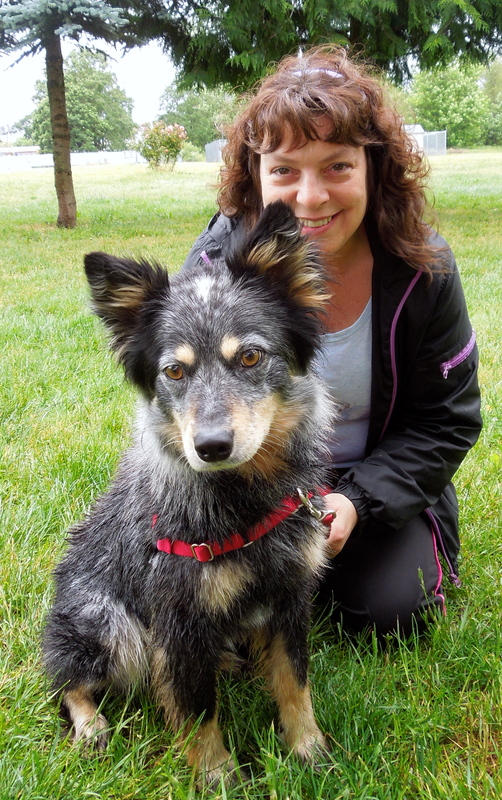 Here is Kathy with new arrival Rachel, a two-year-old Australian Shepherd/Cattle Dog mix. She is a sweetheart! She walks well on leash, takes treats gently, and is beautiful. She knows some commands and would like to learn more. She will make some lucky family a great addition! 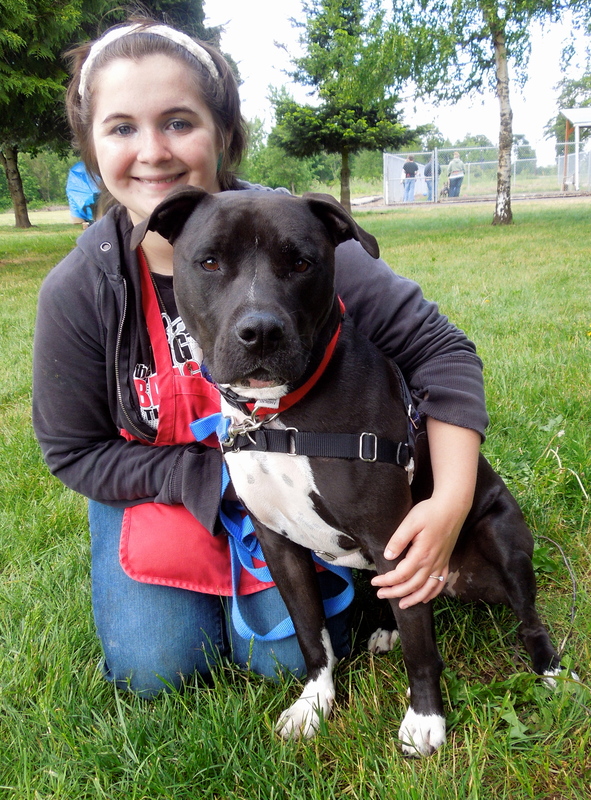 I was surprised to see Thunder, one of my all-time favorites, back at the shelter. It seems he has the urge to go on adventures on his own and has dashed out the door several times. This makes him a prime candidate for a WHS training class during which his next family will learn how to teach him to “wait” at doors for permission to go out. I enjoyed some quality time with this goofy boy both out in the big yard and in the canine classroom when it started to pour outside. We played a fun game of fetch and we worked on dropping the tennis ball at my feet. He was a quick learner. Then we just hung out together. Here are some shots I took of him this afternoon. 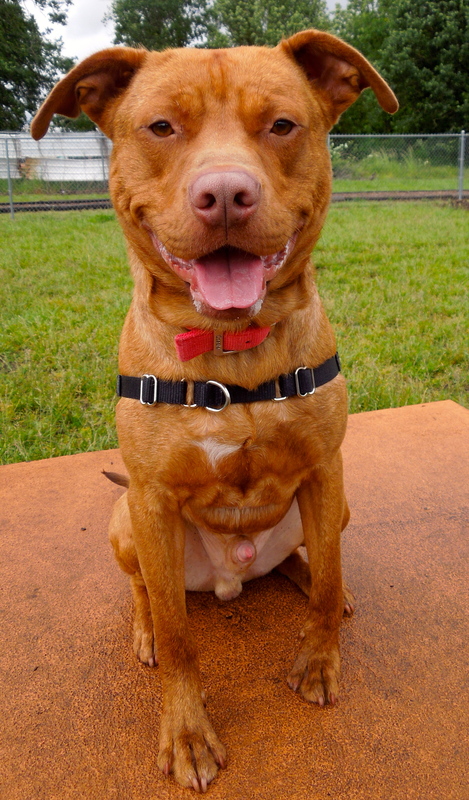 Thunder is a two-year-old Pit Bull Terrier mix. I’m hoping a new family will adopt him soon! For those of you who love Tanner (used to be Rockstar), guess who has just passed his AKC Canine Good Citizen Test with flying colors! 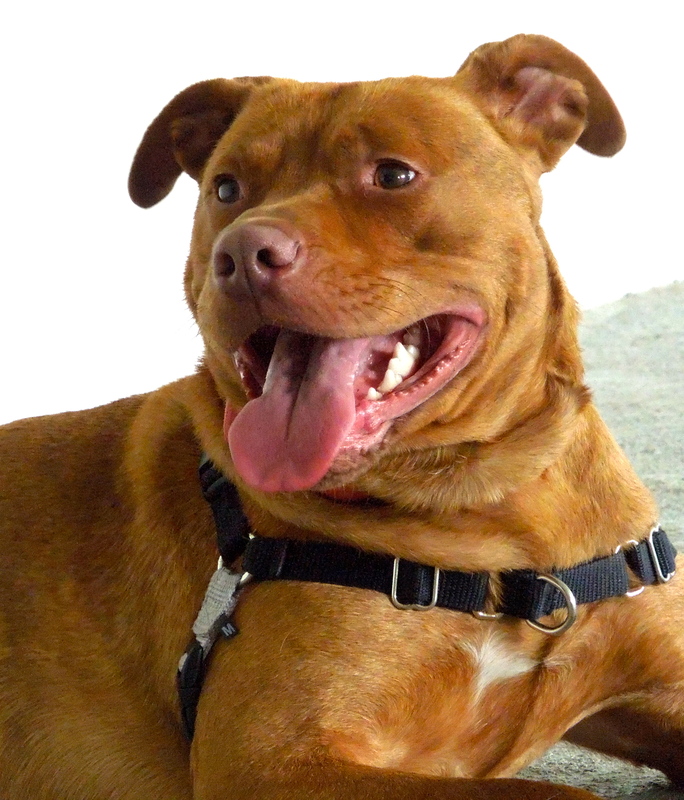 Among other skills, the testing includes the following: accepting a friendly stranger, sitting politely for petting, walking on a loose lead, walking through a crowd, sitting and lying down on command, and behaving politely around other dogs. 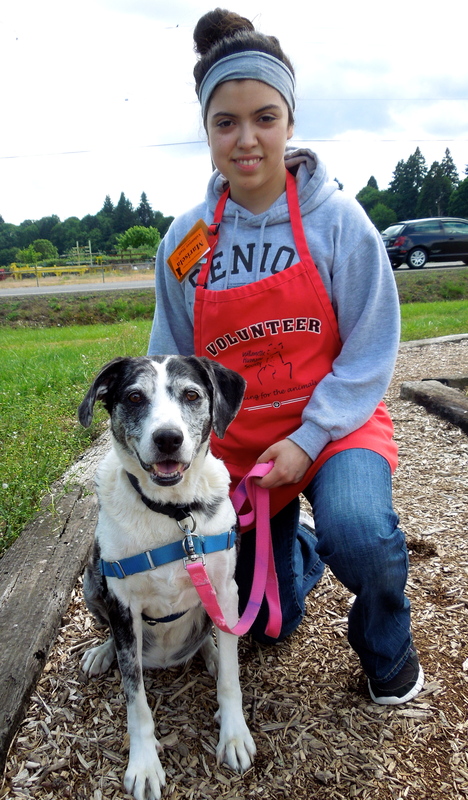 Tanner has come such a long way from the bungling, rowdy puppy he was when he arrived at WHS. Those of us who saw the huge heart hidden inside the rambunctious exterior are so proud of this wonderful boy. Here is his graduation picture with Karen and several more taken of him at home. 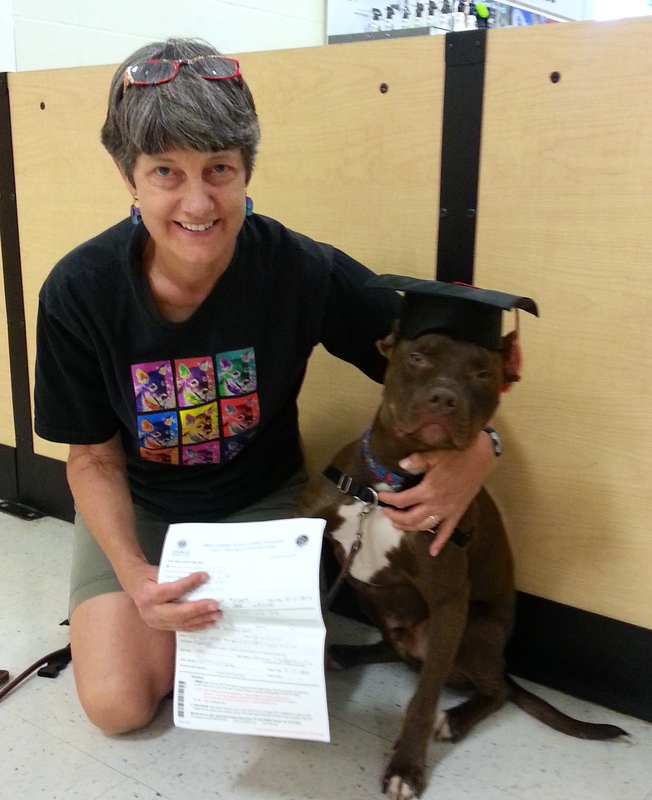 Thanks to WHS for not giving up on him, Linda Crosby for working with him, and Karen for adopting him. Tanner is truly a rockstar now! And on that happy note, I’ll close for this week. Love the name Miss Kitty, I would think that she was named after the actress that played Miss Kitty on the old Gun Smoke series. 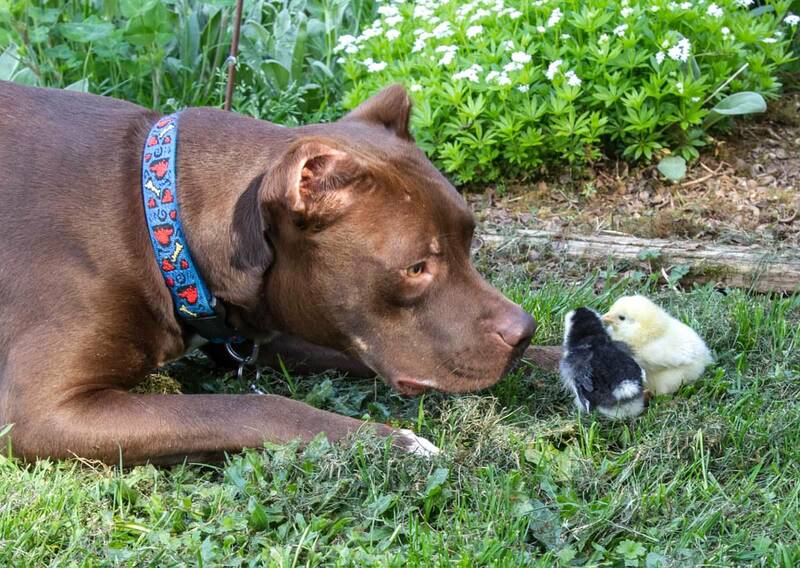 The pictures of Tanner(AKA Rockstar eying the chicks is great! I don’t think my dogs would do that. Maybe the older one, but my young one, and most dogs, would be grabbing it. Tanner is so different from his appearance. So glad to see Banjo is now with Sarah.